An expansive array of vintage instruments that is, for the most part, a retro riot. Drums sound great. Large selection. Sounds live. Melodic instruments let it down. 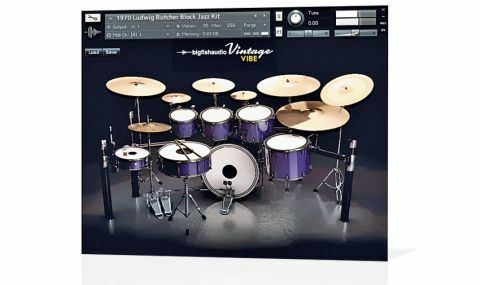 A hefty (11GB) collection of multisampled instruments from the 60s and 70s (plus a few from the 80s and 90s), Vintage Vibe offers an expansive array of drum kits, basses, guitars, keyboards and percussion, with a preset library taking full advantage of Kontakt's built-in effects processors. "The kits have been beautifully sampled, and the scripted interface enables proper multichannel mixing"
The drums are the highlight for us. With manufacturers including Rogers, Ludwig, Slingerland, Gretsch and Zildjian, the kits have been beautifully sampled, and the scripted interface enables proper multichannel mixing (DI, overhead and room mics), and remapping of individual drums and cymbals. It's clear that every effort has been made to keep the sonic character of Vintage Vibe raw, energetic and 'live', and on that score, it's a total success. Some of the melodic instruments let it down - they can be bland and a touch 'GM', even with keyswitching - but this is mostly a retro riot.